I discovered Torre DeRoche’s fun and exciting blog a few years back, when she was in the process of self-publishing her book, Love with a Chance of Drowning. Since then, Torre has taken the international publishing world by storm. Shortly after she self-published her book, Torre was “discovered” by film producers and publishers via social media, and negotiated lucrative book deals with Hyperion (in North America) and Penguin (in Australia). A film adaptation of her story is also in the works. I’m delighted to report that her book is one of the most fun, inspiring memoirs I’ve ever had the pleasure of reading. Pick it up today, and enjoy the ride. What’s your website, and what do you write about? My website is FearfulAdventurer.com. The name says it all: it’s about fear and adventure, but not just travel or sporting adventures; I also cover topics like writing, pursuing dreams, or falling in love. In other words, anything that’s simultaneously exciting and terrifying. Through honest, irreverent, and occasionally cheeky storytelling, I discuss the emotion of fear, hoping to coax readers towards the daring leaps that inspire them. I have the same theme in my book Love with a Chance of Drowning, which is my own story of facing fears to follow my heart. I used to believe that adventurers were a rare breed of super-humans made up from titanium bones and veins pumping with Viking blood. I avoided adventure because of this false assumption, believing that I wasn’t born with the brawny, invincible DNA that’s required for gutsy pursuits. Through chance encounters, I was offered the opportunity to sail the Pacific on a leaky boat for two years, and, despite my morbid fear of deep water, I jumped aboard (love can make you do crazy things!). I hid my fear like a dirty little secret until I began to realize that everyone out there sailing the world is afraid! Turns out, even adventurers are not fearless. Through my blog and my memoir, I want to take the shame out of fear and call bluff on those claiming to be fearless. My audience is anyone who has ambitions that are bigger than their comfort zone, people who want inspiration, or those seeking reassurance with their fears. “No fear,” is a pipe dream developed by a sporting company to sell wares to daredevils, but the only people who truly have no fear are dead. My story of facing my own fears is the most important piece of content in my business, captured in my memoir Love with a Chance of Drowning. My blog is my second most important vehicle for reaching readers. My intuition is always my number one resource when I’m getting started with anything. I could tell you that my WordPress theme, Twitter, and Facebook were helpful, that reading countless books and websites on blogging and publishing were valuable, or that Jenny Blake’s amazing book marketing spreadsheet offered direction, but these tools and resources were all secondary to my intuition. Everything from our imaginations is being created for the very first time, and while it’s possible to seek loose guidance along the way, people can easily become lost if they’re too reliant other people’s strategies. If you follow someone else’s course too closely, the only place you’ll end up is a destination that’s already been discovered. I’ve worked full-time in several design studios in Melbourne and San Francisco. I didn’t mind that work — design studios tend to be pretty easygoing and fun — but running my own business from home freed up time for writing and creative play. When I had momentum with my first draft, I put all other work on hold to get the manuscript finished. Once that was done, I started fearfuladventurer.com as a way to put my work out there, build an audience, and sell my book. It worked! My book sold to publishers after eight months of blogging. Nowadays I mix my freelance design work with my writing career. At about the same time, a UK publisher found my book through a Facebook group, and she also put in an offer to buy the rights. These two offers gave the book buzz, which triggered interest from several publishers. Because of these chance encounters, I ended up selling to Hyperion in a six figure preemptive offer, to Penguin at auction in Australia, and to the UK publisher who found me through Facebook. It has also sold to a Brazilian publisher as well as Brilliance Audio. Crazy. What were some of your main tipping points or “a-ha!” moments? How did they come about? Just before I self-published, an agent in New York, who was considering my manuscript, said, “I have a stack of great stories on my desk, but publishers aren’t buying memoirs right now.” Maybe I was arrogant, but I thought: My story is good, dammit, and I’m going to get it out to readers! I believed in my book, which I’d worked tirelessly on for years, and I didn’t want to carry on with an agent who had given up before we’d even begun. I spent the next few months creating a cover for the book, a website, a trailer, and a launch plan. I self-published through Create Space and Kindle, and then pushed it through my blog and social media platforms. A month later, two offers came to me through social media (see above). The first agent I contacted — my top choice — signed me on a few days after I pitched her, and shortly after we sold to five publishers. I guess you could say that my “a-ha” moment was the decision to go down a non-traditional path to get to my original goal of entertaining and inspiring readers. When I first began, I did all my own web development work. This was as enjoyable and productive as attempting my own toilet plumbing. I worked fourteen-hour days, tallying up over eighty hours to make my blog handsome and functional. When I redesigned my blog earlier this year, I decided to fork out cash for a professional web developer. If I hadn’t stubbornly decided to do everything on my own when I started out, I could’ve spared myself from a cluster of eye wrinkles and the neck posture of a vulture. Pay the experts, people. It’s worth every dollar. If you regard your time on earth as a chance to observe, play, and experience, why would you ever waste your days doing something unsatisfying? What does your business/career look like today? My book has just released to rave reviews in Australia, New Zealand, and North America. It’s set to launch in the UK and Brazil in July. I’m still in the thick of the publicity efforts. My blog is growing steadily as the book sells. The graphs are moving in the right direction. The film adaptation is in script development. Where I’m at today is well and truly beyond anything I’d ever imagined for myself. My next goal is a simple one: to center myself and rejuvenate. It has taken a lot out of me to get to this point and I’m feeling the need to slow down for a little while. I have several creative goals, like making a documentary, writing fiction, studying painting, building a start-up, and traveling the world, but I’m not yet ready to begin planning another big project until the chaos of these launches settle down. Among the mayhem, I’m finding a lot of joy in slowing down and giving myself time to notice the small, pleasant details of life, like drinking pots of hot tea while watching the winter sun peeping through the trees. I’m allowing myself the time and space to focus on now, which is lovely. I see far too many bloggers killing themselves to win popularity contests without having any idea what they’re building for. This is often accompanied by unrealistic assumptions, like: If I get thousands of subscribers, I will be rich! But how will you get rich? What is your product? And are you in this for money or passion? I sold my book for several big advances, but I’m not rich. It took me years to get to this point and it will take me years to get to the next one. Divide that money by the required work hours and you might find you’re better off flipping burgers. You’d better be doing this for passion, or you will burn through an incredible amount of time and energy. This is a hard game. It can be very depleting and emotionally taxing. Blogging is a platform for launching something else. What is ‘something else’ for you? Have a clear vision of where you want to go and then align everything you’re doing with that goal. Don’t just start throwing darts into the dark hoping to hit something. I agree, blogging is a great communication tool to launch a project. I think it’s been great for me in building a community of other bloggers and being able to put value first in my marketing…which has been fun. Great interview. As a self-published author I love interviews like these. I love them because it gives me hope. I’ve also published a book about overcoming fear. I was in a cult as a kid and dealt with harsh after effects. The frictional book is “A Train Called Forgiveness.” Like Torre DeRoche, I know my writing is good, worthy of both a traditional publishing deal and movie rights. My second book “At the Crossing of Justice and Mercy” is even more captivating than the first. I’m working on a third book. Your readers can learn more at http://www.danerickson.net. I love this interview because it shows the writing industry is changing. Self-publishing is becoming a more acceptable way of getting into the business. Great stories are being discovered. I have not yet had the fortune of Torre, but I’m slowly building my blog and gaining more exposure. Torre makes some great points about social media, too. Thanks for this post. That’s what really struck me about this story, Dan – I like what it says about the recent changes in the publishing industry. Inspiring, indeed! I like his reply.. “knowing your purpose”. As a product creator, I use my blog to give away different marketing tactics I use that I “could” easily sell. If my visitors get value, they become customers and eventually “clients”.. Nice interview.. Awesome. I’d be curious who she used for the trailer…. Hi Ben. I wrote and designed the trailer myself. I found the cute whistling music track on a stock music website for the bargain price of $20. I was so pleased when I found that song—the music really captures the tone of the whole story. It was animated by my sister, a filmmaker. You can find her here: summerderoche.com. Knowing your purpose is what allows you to connect with your audience. Start with why is the best Ted Talk and I listen to it over and over again. That’s one of my all-time favorite TED talks, too, Hassan! Should be required viewing for all entrepreneurs! OMG, it’s like you are speaking directly about me. I started my blog because I was told “you must have a platform” in order to sell a book. But in the last year my blog has completely distracted me from my book and the blog has morphed into something other than my original ‘purpose’ of selling my book. So, now I am pulled in too many directions and no longer on a clear focused path to write my book and sell it. UGH. Thank you for the a ha lightbulb moment, and reminding me to let my intuition guide my way. If you’re struggling, my advice is to stop blogging until your book is done, or blog only once a month. You can always build a platform later. I didn’t start my blog until after my book was complete, and then I went 100% on the blog/platform building. You can build a following on Twitter instead, as engaging on Twitter is low commitment and probably won’t compromise your book writing. Then, once you’re ready to start blogging aggressively, you can tap that audience. Thanks so much for the insight! It is so easy to be distracted by the goal that sometimes I forget the journey. Looking forward to rediscovering myself! But… throwing darts in the dark can be so fun. You never know who or what you will hit. 😉 Great tips here. Torre is a smart girl and I never thought for a second that she wouldn’t be a huge success. I love the advice about knowing your purpose. It’s easy to get caught up in building an audience and forget the whole reason you started a blog in the first place. I agree. Throwing darts randomly is a lot of fun! In some ways, that is how I landed my deals—through random dart throwing. But if you want to hit something good, you should at least aim them in the general direction of a predetermined target, otherwise you might find you’re throwing them into a crowd of angry Hells Angels. There’ll never be enough success stories like Torre’s. Doesn’t every guy who meets their special lady one night in a bar think it’s the beginning of something important? 1. She followed a handsome man who smelled good. 2. Torre dove into a big adventure and wrote about it. 3. She asked her dad for advice. My feel good search for a better Monday is over right here. What other reason does a person need to follow love into the deep end of the ocean on a leaky boat apart from, “He smelled good”? Torre, so much good stuff in this interview. Know your purpose, rely on your own imagination, take the shame out of fear – it all resonates as great encouragement for a young writer. We get beaten down so much from skeptics, and I’m glad to hear you followed your own intuition to prove them wrong. Can’t wait to read more on your blog. Nice interview: it resonated with me: I enjoyed reading about the author’s experiences. You are adding value to our lives through such efforts. Intuition nudges us in the “right” direction. We seldom take it seriously, but it is there like a lone wolf. A lone wolf perched on top of a hill and who sits silently in the dead heat of the night, but one who waits patiently. Listening to that “inner voice” is what allows us to separate the wheat from the chaff. It is in our darkest hours that we must take our intuition seriously, because we suddenly discover that we have nothing to lose and a world to gain. Our imagination, on the other hand, can provide us with a vision. We must follow that vision to its logical conclusion and we can work wonders. I am reminded of two young lads who started to tweak and tinker with their toys in a garage in Palo Alto. As a result, they created the PC and the rest is history. Creatives tend to follow their hunch no matter how outlandish it may seem to conventional society. Through this journey, you also discover your passion. And passion is what lights the fire in your belly, compels you to look forward to a brand, new day, and contribute to society. Cheers. This is a fascinating case study on so many levels. I really hear what you say about your intuition. Sadly I too often don’t listen to mine because I’m a logical person and logic and numbers are SO LOUD when my inner voice is often just a whisper. I also hear what you’re saying about clocking hours on the website only to finally outsource to the pros (I have a pro working on mine just now ;). This issue of publishing vs. self-publishing is completely consuming me right now. So many people end up self-publishing because they couldn’t get a contract and from that decision flows all these great opportunities. Anyhoo thanks for sharing your story 🙂 So exciting to see all the amazing things coming your way! Awesome insights. Good to know Torre’s vision and I agree 100% with her. Today most of the bloggers just doing blogging simply as others are also doing it! But they do not have any clear vision and plan. Moreover the blogging atmosphere is also getting very crowdy by lots of new bloggers around. So I have decided to reduced my activity from it and planned to engage my time in something new. I asked my editor at Penguin whether or not she scouts authors through blogs. She says occasionally she does, but it’s very hard to find blogs that can translate into book-length stories, even if the blog is popular and well-written. What makes a great blog does not necessarily make a great book. I thought that was interesting. Putting work out there and hoping to be ‘discovered’ may not lead to anything at all, even if your works is exceptional. It’s like having a really, really great brochure for a nonexistent product. So I think that bloggers who are stuck in Limbo Land need to pause what they’re doing to figure out what their story or product could be, otherwise they’ll just pumping endless amounts of fuel into a machine that is going nowhere. Great interview! I read Love with a Chance of Drowning not that long ago and it was a great book. It was great to hear how you got your book published, Thanks for sharing! Hi Torre! 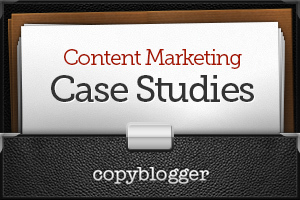 You have no idea how inspired I am after reading your success story both here at CopyBlogger and on your blog. It’s given me the boost and push I need to believe in my writing and to really get down to work. The best lessons I’ve picked up are trusting your intuition and treating your blog as a platform for something bigger—your product. With my purpose in mind, I’m taking baby steps to creating my first product. I’ve no idea if it’ll work, but at least I can give myself a pat on the back for finally breaking out of my shell. Hi Stef. So happy to hear it! I wish you the best of luck. Also KNOW your purpose!! YES! It cuts through the confusion and chaos! Thanks so much for writing this post. I loved it.